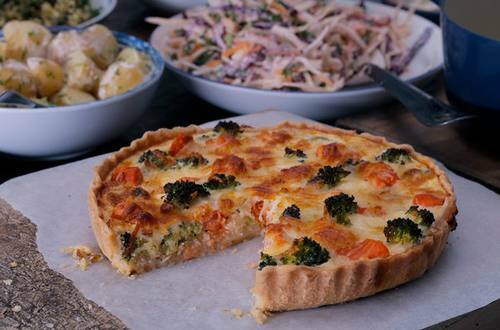 This is the king of quiches, with succulent salmon & tender broccoli incased in a light pillow of cheese & pastry. 1 Preheat the oven to 190°C, 170°C fan, Gas mark 5. 2 Heat 2 tbps of mayonnaise in a pan on a low heat and add the onion, garlic and broccoli, then cook for 5 mins, stirring constantly until softened. 3 Place the broccoli mixture in the pastry case, add the salmon cubes and sprinkle with cheese. 4 Combine the eggs and milk, season with pepper and stir in 1 tbps of mayonnaise for the perfect white sauce. 5 Pour the mayonnaise mixture over the vegetables and cheese. Bake in the oven for 20-30 minutes or until cooked. 6 Finally, revel in your mastery of this regal dish.